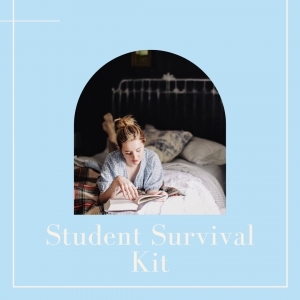 Amphora Aromatics’ Student Survival Kit - Amphora Aromatics Ltd – Supplier of pure essential oils and aromatherapy Products. Amphora Aromatics has a host of aromatherapy essentials for student living. Ooharr Face Masks – help keep spots at bay and skin smooth, hydrated and radiant with this facial detox in a one-application sachet for all skin types – effective, easy to use and won’t break the bank at just £1.20 per 15ml sachet. Choose from deep cleansing clay masks – ‘Star Glow’, ‘Rosie Glow’ and 'Dead Sea Cooler’ or antioxidant-rich cream face masks – ‘Juicy Burst’ and ‘Fruity Magic’. AA Skincare’s Natural Shampoo Bars – free from parabens, preservatives and artificial fragrances, pick from one of eight shampoo bars, all easy to use and long lasting – a 50g bar gives you twice as many washes as a 250ml bottle of liquid shampoo. Also kind to your purse, with each bar costing just £5.95. Check out Zing Fresh Peppermint & Coconut combo to restore hair health and quality. AA Skincare’s Lavender & Tea Tree Moisturising Lotion– this vegan-friendly, easy to absorb lotion is calming and soothing for irritated, unhappy skin, with Lavender and Tea Tree working to hydrate and restore. Perfect for balancing acne prone skin. Only £6.96 for a long-lasting 100ml. Amphora Aromatics’ Lemon Thyme & Tea Tree Lip Balm – at just £3.36 for 30ml, this soothing balm is a winner if you are in a hurry and in need of a quick fix for dry, chaffed skin before catching the bus to campus. Helps protect lips all day and it smells delicious. Amphora Aromatics’ Fresh Feet Lotion – centrally heated libraries and lecture rooms can be tough on feet too. For an instant pick-me-up to refresh weary feet, try this invigorating mix of Tea Tree and Peppermint essential oils – naturally antiseptic, antifungal and deodorising. A steal at just £4.60 for 100ml. AA Skincare’s Grapefruit & Cedarwood Deodorant - made with naturally deodorising Cedarwood and Thyme pure essential oils to help balance natural oils produced by the skin and to attack bacteria causing body odour. Grapefruit adds a zesty note and helps encourage the body to expel toxins. Aloe Vera soothes and calms. Vegan-friendly, unisex and suitable for all skin types £4.94 for 50ml. Amphora Aromatics’ FOCUS Aromatherapy Blend – out help you clear your mind and stay sharp, this clarifying blend of cooling Eucalyptus and spicy Clove will also boost well-being at exam time. Stimulating Rosemary works with refreshing Bergamot and Lemon to help reduce anxiety. A touch of Myrrh helps boost positive thoughts. For use in diffusers or burners. £7.50 for 10ml.